Seeing a Counselor/Therapist. What's Wrong with You? You’re seeing a counselor/therapist? What’s wrong with you? I think this is the automatic thought most people have when we find out someone is seeing a counselor/therapist. Frequently this thought is accompanied by judgment. 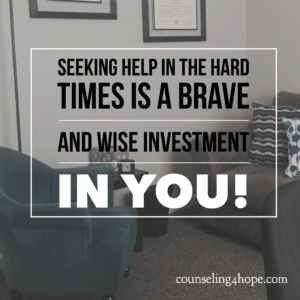 For those who decide to seek counseling, the shame and fear that comes with that predominant thought may contribute to many choosing to avoid or delay getting help. This breaks my heart because I spend time with really good counselors and the help available out there is amazing. 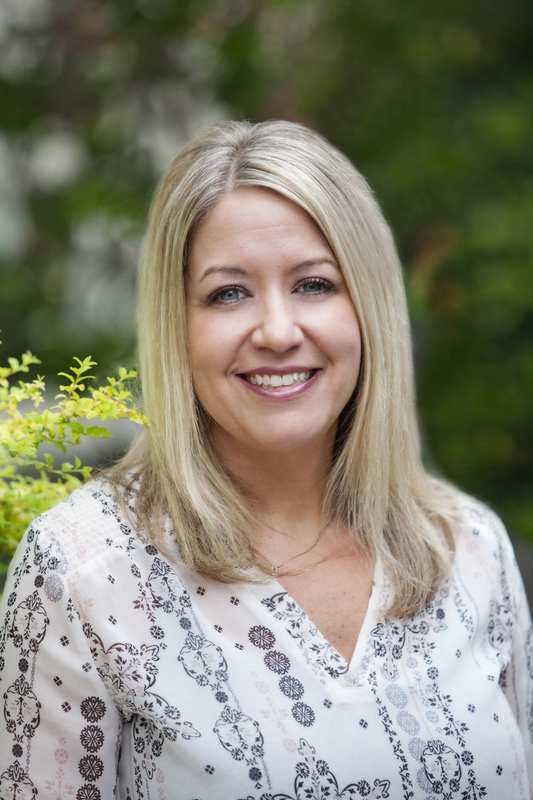 So in this blog, I want to spend some time challenging the counseling/therapy stigma. Let me ask you a question. If you have something wrong with your car and you can’t fix it yourself would you feel shame and guilt for needing to take it in to the repair shop? Of course not. You have limited knowledge about cars (and a lot of other things) so you go to someone with more knowledge about that subject and pay them help you solve your car problem. Now let’s say you are struggling with overwhelming stress and fear. So much so that it is beginning to impact your ability to function in life or maybe even leave your home. Telling yourself to get over it hasn’t worked and you really aren’t sure what to do next. You’ve talked to your friends and family but they don’t know how to help you either. What if I told you that is one of the areas I specialize in. I help people understand how anxiety impacts the body, learn coping tools to calm the body, look for what is underneath the anxiety and deal with that. Look at root causes: Figuring out what went wrong and healing, growing, or changing. Facilitate a safe place to heal and grow. This is the ultimate safe relationship to explore who you are and who you want to be. Now, I want to speak to the Christian crowd for a minute. There is a group of believers that do not believe in counseling/therapy. They feel that only prayer and scripture can solve life’s problems. I strongly value prayer and studying God’s word. Yet we don’t apply that line of thinking to any other profession. We wouldn’t refuse to go to a doctor and just pray. No, when a loved one is sick we go to professionally trained person to find healing. Why would we discourage others from finding help with the brokenness that we as believers know is a part of this world? We, as believers, know that the world is broken and people are impacted by that brokenness. Brokenness and sin’s impact is everywhere and sometimes its effects are so impactful that it’s normal to need support and help to deal with it. I felt a specific call by God to counsel. I pray over my counseling room before I see clients and invite God into the session. I am a theology nerd and spend a lot of time learning and studying, theology and psychology. I believe that since God designed the world and humans, that true and honest scientific/psychological/sociological studies will validate and give us insight into what God has designed and laid out in scripture. I am honored to do what I do. It is a gift to sit and walk with those struggling. It is exciting to see people grow, change, and heal. It’s amazing to be a part of God’s work of pushing back darkness and lies. 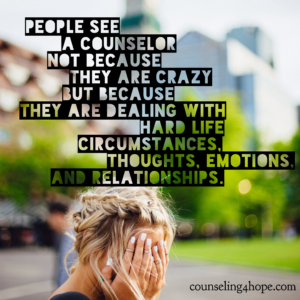 I pray that if you are considering counseling, you will reach out, talk to a counselor on the phone, ask questions, and find someone you feel comfortable working with.